the need for milk quality policies that are not only effective but also realistic, sustainable and equitable. 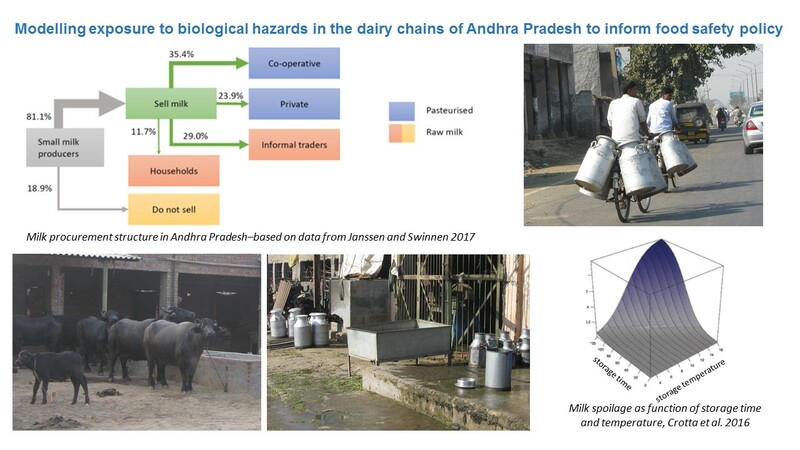 We have developed a work plan that combines microbiological surveys of milk and dairy products, probabilistic modelling of the likely impact of control strategies and strong stakeholder engagement including participatory model building to explore the broad implications of milk hygiene policies and identify gender based constraints. Our approach relies on the use of risk assessment frameworks, which are well established as tools to support food-safety policies worldwide, but yet to be widely adopted in LMICs. This risk modelling methodology will be combined with system dynamics (SD) modelling, a holistic approach for studying the behaviour of complex systems incorporating feedback mechanisms which could undermine the effectiveness of policies over time or result in unintended consequences. Stakeholder engagement will be a key activity along the whole project to facilitate translation of scientific outputs into improvements at farm level (improved farming practices), at intermediate level along the chains (improved milk handling practices) and at policy-level (improved risk-based regulation). Stakeholder engagement will be at all stages of the project, iterative, and completed by training activities to enhance local research capacity on technical aspects of risk modelling and on interpretation of model outputs and their use for policy formulation. To maximize potential uptake of research outputs beyond AP (within India and in other countries) a number of national and international organizations well positioned to facilitate dissemination and uptake of findings will be engaged in the project since its early stages.